In India beekeeping has a bright future. For the youth of India it is very helpful and growing business to earn money and establishment of business. This business starting cost is very small. You just need some experienced person to spend time in this field with them. 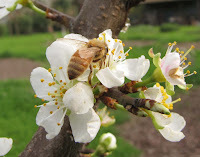 Learn the things how to take care of bees and how they grow their bees and some skill of managements to manage business. Many government and private organizations were provide free of cost training in India. Some Government organizations and banks were helping by finance and provide loans on this business.